Shape of the shell in side view: Almost linear, though somewhat thicker in the middle and slightly narrowed towards the ends which are rounded off. A small portion of central part of the shell is strongly convex, forming a protruding ball shaped cap on either side. System of Rings: From an inner little spherical shell 4 radial rods extend in the form of a cross to the 1st ring, which forms an irregular quadrangle with rounded corners. The radial rods pass through the middle of the sides. Beyond this ring there are, on the specimen illustrated, 6-7 rings, each joined to the one next outside by a continually increasing number of radial rods. It is likely that the number of the rings increases as time goes on. The inner rings are still somewhat angular, the outer, however, more regular. The outmost ones seem, however, again to show irregularity, which perhaps, disappears with age. Pores: The strongly convex central part, which corresponds fairly well to the 1st ring, has unusually large, roundish, hexagonal pores, which are much broader than the separating walls. The rest of the pores are exceptionally small and uneven in size, most of them being narrower than the intermediate spaces, or of the same width as these, very little larger outwards, 2-3 on the space between two rings. Radial spines: Around the disc a few very narrow, needle-shaped radial spines protrude, apparently in no definite order. Numerous radial rods are to be found between the outer rings; some go through two or more, others again only connecting two rings. Byspines: Very small, almost punctiform, short byspines, largest and closest together on the convex central part, the others being only scattered over the disc. Dimensions: Diameter of 1st ring 30μm, of 2nd 42μm, of 3rd 59μm, of 4th 78μm, of 5th 98μm, of 6th 120μm, of 7th 144μm, 8th ring irregular and as yet incomplete. The rings are thus somewhat broader ontwards. The large pores on the central part 5-6μm, the small ones only 1.5-3-4μm. The few piercing radial spines only protrude as far as a distance equal to the breadth of the rings. The disc is 37μm thick at the convex central part, outside this 30μm, only about half as thick at the margin. The specimen which is illustrated (Jørgensen, 1905) seems to me to suggest that the few piercing radial spines are in reality radial rods which penetrate several rings, similarly to those which are seen here and there farther in between the rings. In this case, it is hardly correct to consider them as the radial spines characteristic of the genus Stylodictya. The above species might just as well, for that matter, be classed as belonging to the genus Porodiscus (without marginal spines); but as one cannot be sure whether there may not be radial spines on the outside ring in the fully developed individual, I have retained the species under the genus Stylodictya, where it would at once be placed after a less critical examination. It is certainly also closely related to the following species. In structure it is very like Porodiscus orbiculatus HCK, which, however, wants the very characteristic, coarsely porous, central part. This has the appearance of a spherical shell with a diameter greater than the breadth of the disc, with a smaller sphere in the middle (this sphere is the innermost shell) and with equatorial rings outside. Only twice noticed in 1899: In the sea off Gaukværö, 19/1, 0-700 m; in the sea off Röst, 22/3, 0-900 m. This makes it very probable that it is an oceanic, deep water species, which only exceptionally comes to our coasts. Remarks. I separated this species-group from Sty1odictya validispina and Ommatodiscus pantanellii on the basis of the presence of concentric, latticed, discoidal shells in the central region of the test (text-fig. 13) rather than concentric rings present between and perpendicular to two, parallel, latticed sieve-plates; therefore, in side view the central region of the test is biconvex (P1. 10, fig. 5). Whether this character is a more fundamental basis of separation than the number and regularity of the concentric rings or discs could not be determined. The nature of the latticed concentric rings (or spiral whorls in a few specimens) which are present beyond the central region of concentric, discoidal shells in this species-group is highly variable. Three general types were observed, but the relationships between them are unclear, i.e., a few specimens show gradations between these types. The first type (Pl. 10, figs. 3,6) has closely and equally spaced rings similar to Stylodictya validispina Jørgensen. The second type (P1. 10, fig. 7) has fewer rings which are more widely spaced, and the outermost rings are suboctagonal in shape in a few specimens; in several specimens the outermost rings are incomplete, consisting of concave, outwardly curved, discontinuous portions, each attached to a single radial beam. The third type consists of very irregular rings (P1. 10, figs. 2, 4). All these forms, however, have a similar central region, i.e., concentric discoidal shells, not rings, and fully developed forms, which are generally circular to elliptical in outline, have a similar fine-pored, marginal chamber with a relatively wide pylome surrounded by numerous tooth-like spines. The latter character, however, may represent a secondary characteristic and have no specific value. All specimens have numerous radial beams, a few (as many as 10) of which are continuous to the central shell. No beams extend as free spines beyond the outer marginal chamber. The pores of the latticed plates are similar to those of Sty1odictya validispina and Ommatodiscus pantanellii. Because the relationships between these three types are unclear, the writer considered it best to combine them into one species-group. Further study is needed in order to determine whether the three types are individual variants or represent separate species. 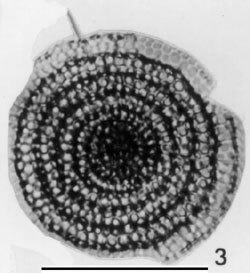 The margin of fully developed forms has a pylome and completely covers the outer beams or conical spines arising from the outermost ring; therefore, this species-group technically belongs to the genus Ommatodiscus Stöhr (1880, p. 115). In specimens with the margin not fully developed, however, the spines or beams are free; thus they technically correspond to Stylochlamydium Haeckel (1882, p. 460) because there are usually traces of a thin, small-pored margin which represents a portion of the marginal chamber. Forms with the outermost beams or spines not developed technically belong either to Trematodiscus Haeckel (l861b, p. 841) if there are no traces of the margin or to Perichlamydium Ehrenberg (1847, p. 54) if the margin is present. On the basis of the morphology of fully developed specimens this species-group was placed within Ommatodiscus. Due to the unclear relationships between the Gulf specimens of this group and the possible inclusion of this group in four separate genera, no species name was chosen from the literature, nor is a new name proposed. Further study of type material of numerous species illustrated in the literature may reveal that they are the same as the Gulf species. The distinction between concentric discoidal shells and concentric rings in the central region of the test was not made by earlier workers. Measurements; based on 30 specimens from stations 46, 71, and 81: diameter of complete specimens (with all or most of the marginal chamber complete) 172-317 µm; diameter of outermost concentric discoidal shell of the central region (3-7 shells) 41-113 µm; diameter of outermost ring (complete or incomplete) 123-275 µm. Distribution. Incompletely developed specimens of this species-group cannot be distinguished from incomplete forms of many of the species of the Ommatodiscilae; therefore, the frequency of this group or of other spongodiscid species may be higher than indicated. In the Gulf this species-group is absent only at stations 203 and 214. It is rare only at stations 133, 151, 191, and 192, and common at all other stations, at most of them being one of the five most abundant species. Its highest frequencies were observed at stations 95 (7.4%) and 99 (7.0%), located in or near regions of upwelling. Across the Gulf from stations 91 through 99 it has a greater frequency near the eastern and western sides but decreases in the axial part of the Gulf (station 93, 3.4%); therefore, in local areas upwelling may control its distribution. It occurs with greater average frequency in the southern half of the Gulf than in the northern half, suggesting its greater affinity for oceanic water masses; however, at a few stations in the northern Gulf, namely 184 (5.4%), 194 (4.5%), and 136 (4.0%), its frequency is similar to that in the southern Gulf, suggesting its tolerance of higher salinity and temperature. Thus, it has a cosmopolitan distribution in the Gulf but is also controlled, in part, by upwelling. Without further study of this group, including study of topotypic material, nothing definite can be stated about its world-wide distribution. It may be confined to tropical seas.